I recommend using his recipe because everything he makes is more than delicious…it’s spectacular and it’s always made with attention to taste and made with love. 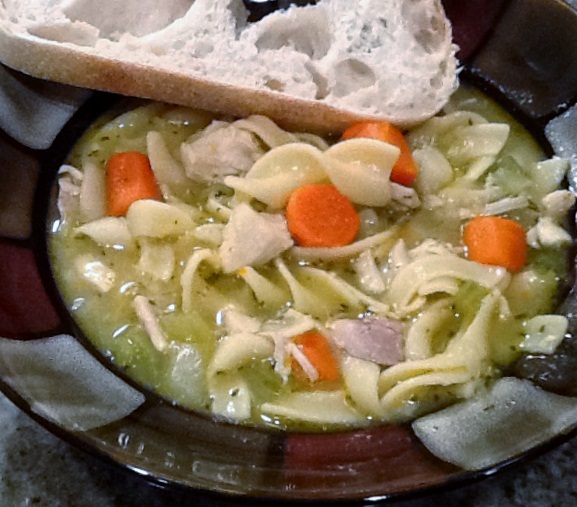 Chicken Noodle Soup…In the Words of Bobby G.
Fresh ingredients for rich stock. 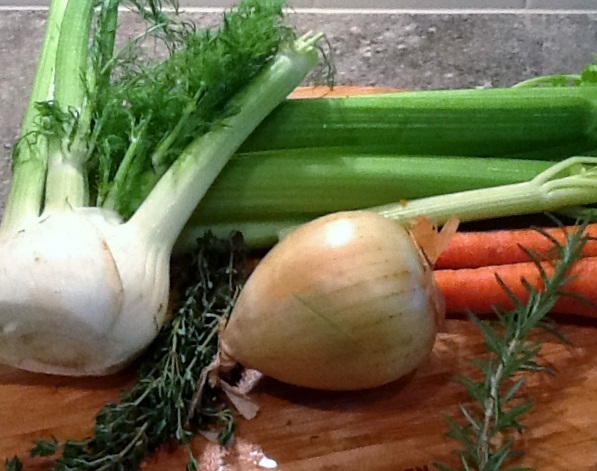 In a large stock pot, add olive oil, onions, celery, carrots, fennel, and garlic. Season with 1 teaspoon kosher salt and 1/2 teaspoon fresh ground black pepper. Stir and cook over medium heat until vegetables are colored a bit and a little cooked (5-10 minutes). Add the thyme, bay leaves, rosemary, and stir. Add the chicken stock slowly and turn up the heat until close to boiling, then turn the heat down and cover. Add a couple heaping teaspoons of Better than Bouillon® brand chicken bouillon and a teaspoon of kosher salt. Let simmer/low boil for an hour or so until the vegetables are tender. Add noodles and cook uncovered for 10 minutes. If too thick, add a couple cups of water and chicken bouillon to desired consistency. Add cut-up chicken and return to low boil, then turn the heat off. Let cool a bit and eat. Keep in mind that soup is always better the next day after refrigerated, which allows the flavors to come out better. Add sourdough bread and you have a meal! In a large stock pot, carrots, fennel, onion, peppercorns, thyme sprigs, rosemary sprigs, bay leaves, and garlic. Put chicken fryer in the pot and add 4 quarts of water. Cover; bring to boil, then lower to a low simmer/boil. Cook for a full hour then remove chicken. Allow to cool a bit then pull all the meat off the chicken and discard the fat and skin. Set the meat aside. Put the chicken carcass back in the stock pot and cook/slow boil, covered for another two hours. Pour broth through strainer; keep the broth and discard the rest. Refrigerate overnight or put in the freezer long enough for the fat to form at the top (few hours). Remove the fat layer then stock is ready. Click here for Bobby G’s BBQ. Photos by Bobby G. from Bobby G.’s kitchen. There is a game in our neighborhood — maybe you play it too — where during the weeks before Halloween, the kids “Boo” houses. Kids knock on a friendly door, run away and leave a sign that says “Boo” along with some candy. Sometimes there is a poem or a riddle and the signs can run from plain lettering to elaborately decorated placards. The game catches on because the house who is Boo-ed must go on to Boo another house. The boys wanted to Boo some houses last week. However, I had no candy in the house. But, motivated boys will figure out a way. Actually, what a great idea for around the campfire. 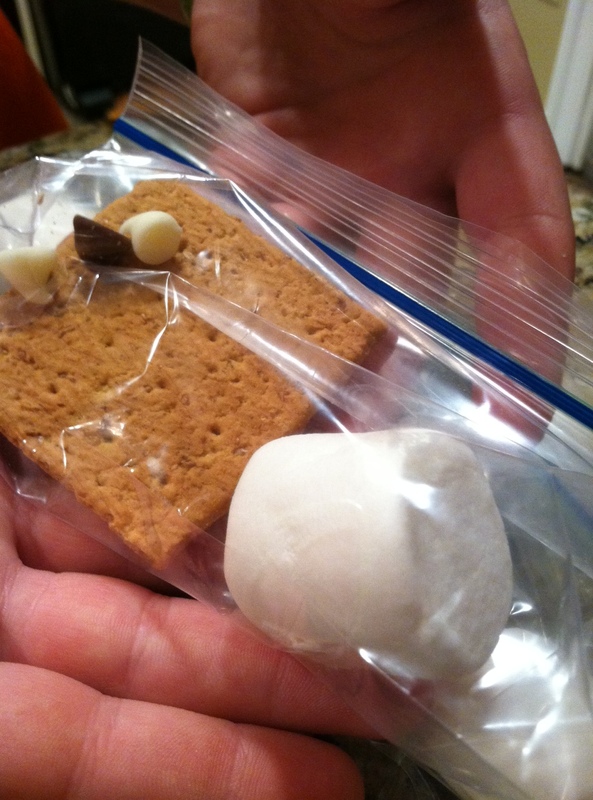 Assemble S’more Sets ahead of time with all the ingredients and hand a baggie to each person to make his or her own S’more. This keeps the campfire area a little more tidy instead of open packages of ingredients getting spilled and going stale. The only thing I would do differently from the boys’ S’more Sets is to include a chocolate bar square in place of the chocolate chips. They probably would have done this, but being the industrious boys that they are, they worked with what they had. Happy Halloween. Keep the goblins safe. 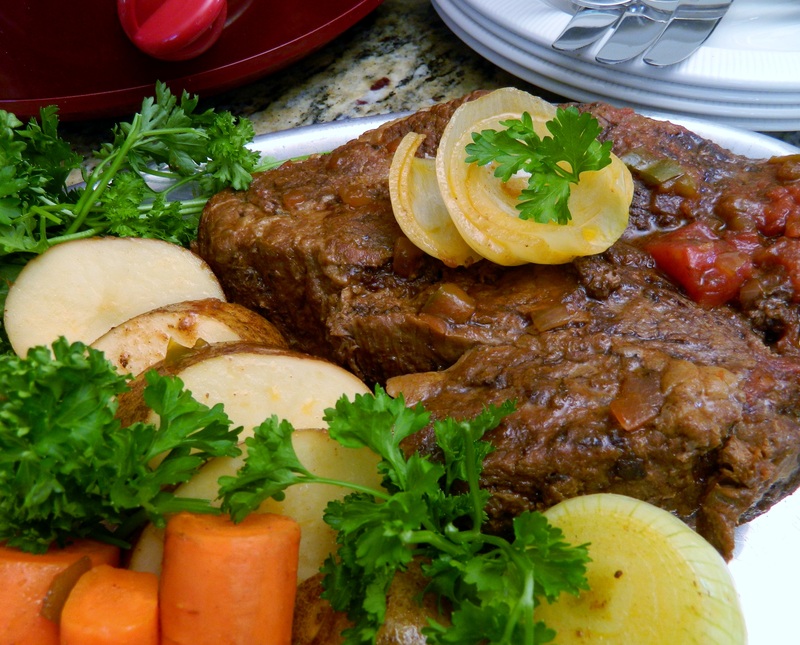 Welcome your family home from the school or work day with a pot roast — slow cooking all day while you were busy with all the things you do. This is a short version of an earlier post titled “Feeding the Traver, Or What Do Eloping and Chili Have in Common? 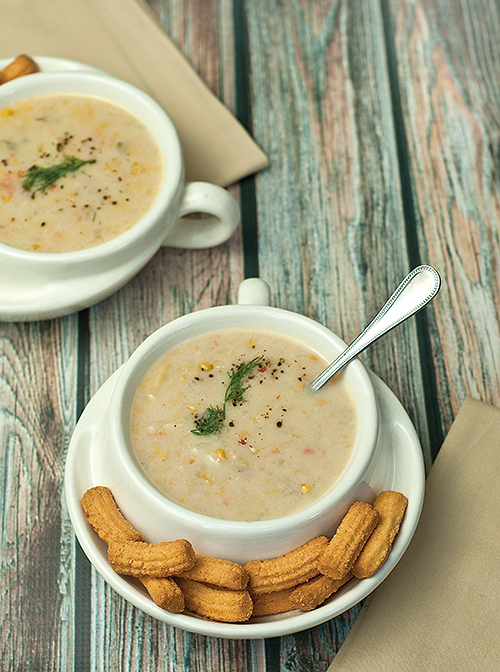 Make this easy corn chowder today and it gets better each day. Add a salad and crusty rolls and you have supper. For some reason, I only make this in the fall — it’s warm and delish and conjures images of Indian corn. 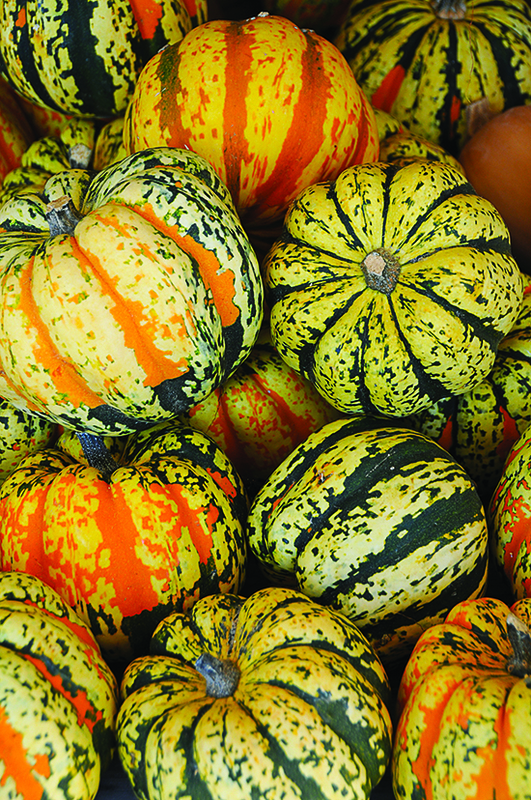 Autumn Corn Chowder recipe is on page 65 of the Fall 2012 issue of Celebrate Home Magazine. 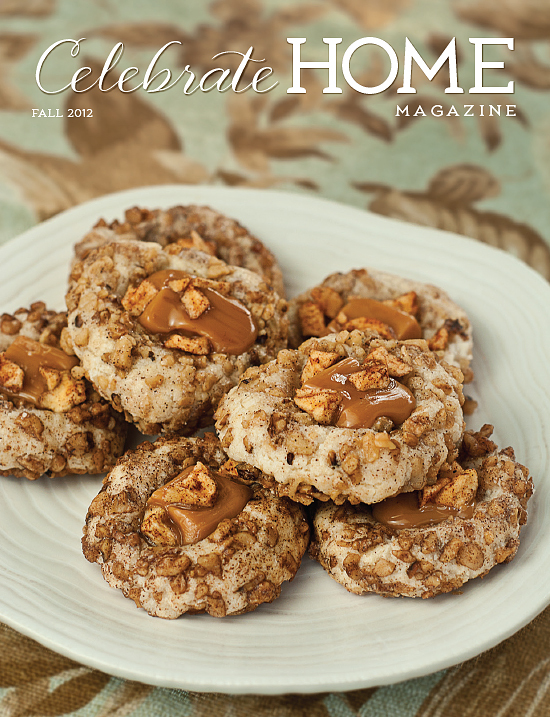 Here are some images from the fall issue of Celebrate Home Magazine. Photos and spreads by Cindy Dyer. The time has come for a magazine like this—highlighting ordinary people doing extraordinary things. No matter your budget, your skills or the size of your space, we’ll enthusiastically share experiences of those who nurture the space they call home. Let us inspire you! I’ve teamed up with the talented and renowned Cindy Dyer, whose artistic direction and photography bring the Wow Factor to the pages. We are passionate about all things home and welcome you to open the door and come on in. We also welcome you to be contributors. This magazine is for you and about you.